Mega Happy Hunter: First Day of School! 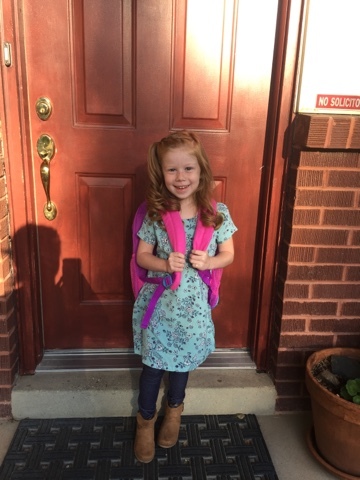 Kindergarten received an adorable redhead today!! She woke up super grumpy this morning. She was fighting everything and saying she didn't want to go to school. I finally firmly told her that this was a fun day and she wasn't going to ruin it by being mean. She went to the bathroom and came back and bounded in and exclaimed "Mom! I was right! I am excited for school!" and she was nothing but smiles and giggles since. She's such a cute little goof. I'm so glad she decided to change her attitude. 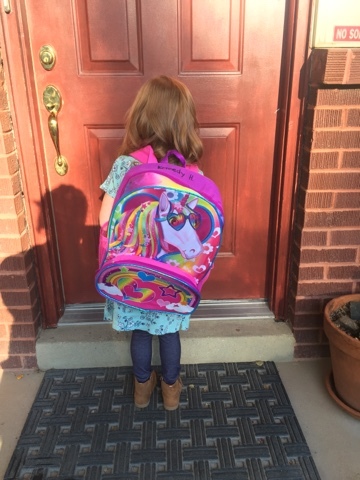 Weeks ago I took her to the store to pick out a backpack... I tried every trick I knew to persuade her otherwise, but she settled on this one. Lisa Frank, eat your heart out!! She had a great first day and was super happy. I on the other hand, am totally freaking out. She will have homework this year. She gets to do centers. They go to PE and the computer lab and art class... When did she become a real life student?! Plus, she still has some catching up to do and I am panicking about how to get her to work with me. I've tried and tried but she just won't do it! And she will need the extra time this year. So I'm worried. But hopefully with some creativity and some prayer, things will work out one way or another. Overall I am really excited for her. And I am super excited to be able to drop her off and pick her up without having to walk her to her classroom haha! They have testing the next couple days so she won't have school again until Monday, but it'll be awesome. I can't wait to see what she will learn this year.